For the November installment of The Future Now: Neuroscience and Emerging Ethical Dilemmas (NEEDs), the Emory Neuroethics program hosted Dr. Melody Jackson, director of the Georgia Tech BrainLab. Dr. Jackson spoke about her research on brain-computer interfaces and how she and her colleagues are using them to develop communication technologies for people who are paralyzed. Brain-computer interfaces (BCIs)—also called direct brain interfaces (DBIs)—are systems that can enable an individual to control computers and other devices with their brain activity. For the devices that Dr. Jackson and her colleagues have developed, people can select letters and words on a computer screen and control motorized wheelchairs. Some of the BCIs record brain activity from the motor cortex and are activated by thinking of making a certain movement. Others record activity from Broca’s area and are activated by thinking of saying “yes” or a nonsense syllable (to indicate “no”). Dr. Jackson emphasized that the BCIs for communication are not “mind reading.” What the person is specifically thinking about has nothing to do with what they use the device to say. Their thoughts activate a cursor which allows them to choose words and letters, similar to moving a computer mouse with one’s hands. The three most common methods that BCIs use to detect brain activity are implanted electrodes, functional near-infrared spectroscopy (fNIR), and electroencephalography (EEG). Implanted electrodes are surgically inserted in the brain and record signals (specifically, action potentials) directly from neurons. This method provides more accurate detection than the others, but, because it requires surgery, there are risks and a potential for complications. 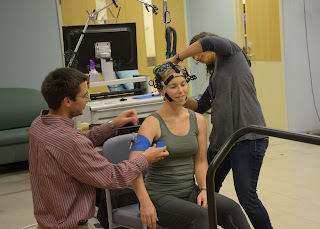 fNIR uses a cap or headband-like device to measure blood oxygenation (and therefore activity) in brain regions based on their absorption of near infrared light. fNIR systems cannot be used in real-time because there is a delay in detecting brain activity. 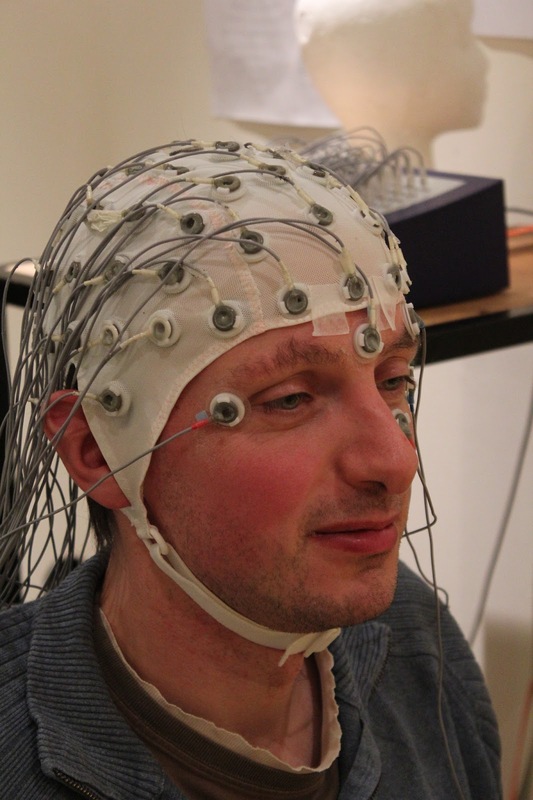 With EEG-based BCIs, electrodes placed on the scalp record brain activity. They are the most commonly used as the technique is noninvasive, can work in real-time, and is well understood. In her talk, Dr. Jackson’s identified four main areas in her research where ethical issues arise: consent, managing expectations, managing risk, and interpretation of responses. 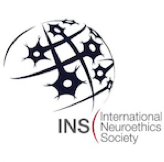 In studies involving patients with locked-in syndrome, it is even more critical than usual to make sure that clear consent is obtained, because of the patients’ severe disabilities and subsequent vulnerability to abuse and exploitation. Those who participate in the studies need to have a way of clearly indicating whether or not they consent to the research. The design of the studies also needs to take into account the fact that people with locked-in syndrome often have progressive diseases; their abilities to communicate may also worsen over time, making it hard for them to maintain or withdraw consent. 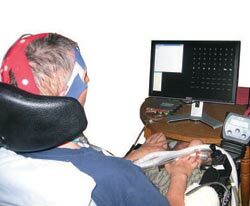 When BCI-based communication devices are provided to paralyzed individuals, researchers, clinicians, and other experts need to provide accurate information to patients and their families on the capabilities and limitations of these communication technologies in order to prevent them from developing unrealistic expectations. 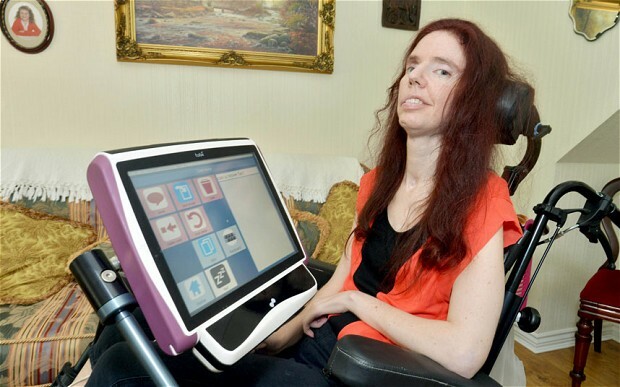 Those with locked-in syndrome want to be able to communicate effectively, but the BCI-based communication technologies are still fairly basic and require practice to be used effectively. They do not work as quickly as some might think, and they do not work for everyone. Regardless of efficacy, these devices may simply not be available to all patients, as these devices are expensive and are not currently covered by health insurance. As with other medical interventions, there is also the issue of managing risk, especially for the types of BCIs that require surgically implanted electrodes as they carry the possibilities of infection and damage to the brain tissue. Patients, researchers, and clinicians need to weigh the risks against the benefits. In this situation where the device could allow a severely disabled person to communicate, many might think the risks are worth it. Perhaps the most pressing and complex issue with any such communication technologies regards the interpretation of patient responses. It is important that responses are interpreted correctly, especially when it comes to issues regarding medical care. But the technology is imperfect, and the patient’s family and caregivers might have their own agenda or biases. They may make decisions based on what they think would be best for the patient or what they think the patient would want regardless of what the patient is actually communicating. If an individual with locked-in syndrome indicates that he or she wants to go off life support, it may be hard for their family to hear, and they may raise doubts over whether that is what the patient actually wants. The opposite might also be the case: the patient’s family might think that discontinuing life-sustaining treatment would be what’s best for the patient, even if the patient indicates otherwise. A similar situation could arise with malicious intent. Dr. Jackson gave a cautionary example where a patient’s family member claimed the patient wanted to go off life support. But the family member stood to gain from the patient’s death through inheritance. Care must be taken to make sure that the patient’s wishes are accurately understood. A patient’s wishes regarding medical care and treatment can also be affected by access to the communication technologies themselves. Dr. Jackson explained that once the patients in her studies were able to communicate through a BCI, most, at first, expressed that they wanted to discontinue life-sustaining treatment. Some did have their ventilators turned off due to this communication. On the other hand, virtually all the patients who remained in the studies rescinded their DNR (do not resuscitate) orders. The ability to communicate improved their quality of life enough that they reassessed their end-of-life decisions. This raises the question of when and how the patients’ wishes should be carried out. Should they be told that access to new communication technology may change their minds? Should they be required to use the communications device for a certain amount of time before making any final decisions? Any decisions regarding going off life support would require serious discussion between the patient, their families, and their clinicians. The research done by Dr. Jackson and her colleagues deals with several topics that are each controversial on their own: research with human volunteers, neurotechnology, treatments and interventions for those with disabilities, and end-of-life care. 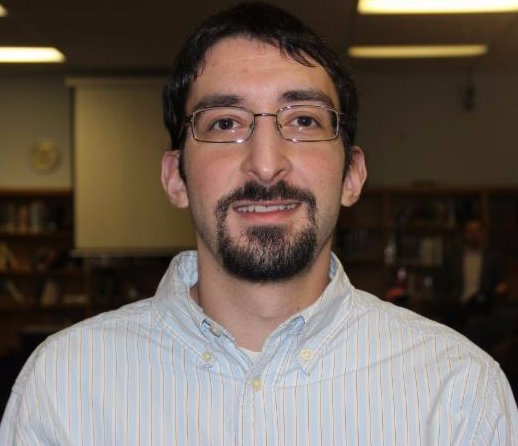 The unique nature of the work forces researchers to confront serious ethical issues regarding quality of life and end-of-life care. But these researchers’ efforts are providing ways for those with locked-in syndrome to have a voice—to make their own decisions regarding their medical care and their lives. Jonah Queen is an editorial intern at AJOB Neuroscience and a supporting editor for The Neuroethics Blog.